Doyle Dykes Virtuoso Fingerstyle Guitar. Composed by Doyle Dykes. Artist/Personality; Guitar Method or Supplement. Acoustic Masters Series. Acoustic; Fingerstyle. Book; CD. 136 pages. Alfred Music #00-0664B. Published by Alfred Music (AP.0664B). ISBN 0757994083. English. Transcribed by Jon Chappell. Doyle Dykes is the natural heir to Chet Atkins' throne. This Nashville-based virtuoso fingerstyle guitarist plays solo guitar arrangements of originals, hymns, and secular pop music with astounding feel and unheard-of technique. 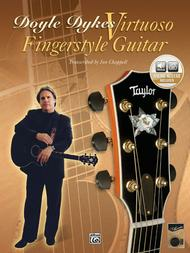 This volume includes Doyle's original guitar compositions and his hugely popular arrangement of The Beatles' song "Girl." Songs are: Angels Desire * Birmingham Steel * Caleb's Report * Celtic Cowboy * The Changing of the Guard * Country Fried Pickin' * Girl * The Howling of the Wood * The Jawbone * Martha's Kitchen * Miss Haley's Music Box * Misty Nights in Tokyo * The Road Back Home * Self Portrait on Acoustic Guitar * The Visitation * Wabash Cannonball * White Rose for Heidi.